large and giant breed puppies reaching an adult weight of 25kg or more. This product is NOT recommended for feeding during pregnancy and lactation due to the specially adjusted mineral content. Nutrition that Understands Your Dog. Large and giant breed puppies grow so fast that they have very specific nutritional requirements. 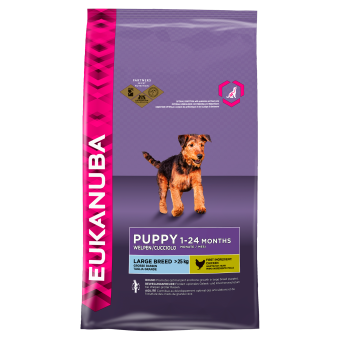 Eukanuba Puppy & Junior Large Breed has adjusted protein, calcium and energy levels, and is formulated with the Joint Management System JMS. JMS helps develop healthy bones and joints by providing glucosamine, chondroitin sulphate and a precise balance of Omega-6 and Omega-3 fatty acids. Fresh, high-quality ingredients for a great, natural taste. A complete pet food for large and giant breed puppies. Chicken(>20%), maize, wheat, fish meal, barley, sorghum, animal fat, dried beet pulp, dried whole egg, chicken digest, brewer's dried yeast, linseed, salt, DL-methionine, potassium chloride, glucosaminehydrochloride, chondroitinsulphate, marigold extract. Additives per kg: Vitamin A: 15000 IU, Vitamin D3: 920 IU, Vitamin E( a-tocopherol):100 mg, Copper as Copper II Sulphate: 25 mg, a-carotene: 10 mg.